Cembre MTA-C bi-metallic pin or stalk connectors are made from aluminium of a purity equal to or greater than 99.5%- the aluminium crimp barrel is friction welded to the pin achieving an excellent connection between the copper pin and aluminium barrel. Crimp barrels are capped and grease filled to avoid aluminium oxidation. 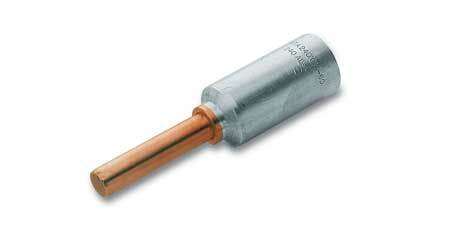 Suitable for 11kV-33kV electrical termination applications.